“I never really felt that I fitted in, it was strange being the only girl in a family of boys even though it was very much a female-dominated environment- because I was more of a boy than any of my brothers and they wanted me to be a little girl […] I did all the dancing, tried to put me in pink flee dresses and none of these was me, that was quite difficult”. Shanon came out as a lesbian when they were 23. Shannon remembers distinctively that moment. On the contrary their awareness concerning their gender identity is a continuous process. “It took me a long time to pick up an identity as a lesbian. I have never ever felt totally comfortable with a group of women, I felt more comfortable with guys but always felt I did not fit in either sides. At times I felt very feminine, at times v masculine […] When I was 23 I bought first house and had a big armchair- and I decided to have a knitting bag on one side and on the other side my ashtray and my pipe”. “It’s much less definite and clear cut when it comes to my gender identity, it’s always about exploring, Even nowadays I am exploring and it changes”. Shanon does not wish to transition to be male, because they would still be gender queer: “that would not be right, neither gender is fitting for me or you can say both genders are fitting for me, depending on the time of the day or whatever […] That would be pointless to go from one gender to another for myself. Some other people feel fulfilled when transitioned, but that’s not for me. I have considered top surgery because I don’t think I look right, I would prefer a flatter line it’s more an aesthetic thing than anything else”. Shanon explains that it was through their faith and the Church that their became more aware of their fluid gender identity. “If I am denying an aspect of me, then I am denying what God has created for me- this is a very important part of my Christian faith. I became more comfortable in thinking of myself as gender fluid”. Shanon initially worshipped in a Baptist Church but then did not feel comfortable anymore there when she came out as a lesbian. Shannon explains that they were never openly discriminated against in the Baptist Church or any other Christian Church. They said that is mostly because they knew how to play the game, how to negotiate boundaries, how to avoid open rejection. 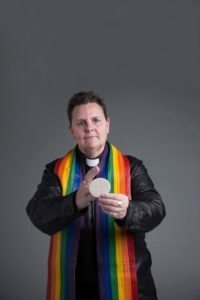 They explained that as a pastor they had heard many stories of people discriminated against in other churches because of their sexuality or gender identity. They spent some time “Church hopping” and then joined the Metropolitan Community Church in South London in 1998. “I had no problems because I knew when problems would arise and I avoided those situations accordingly. That’s why it was so nice to go to the MCC, there was not that sense of holding back all the time, of being careful. I could fully give myself to that church and I could offer all the skills God gave me for the benefit of that church”. Shanon is a Minister with the Metropolitan Community Church, which is a denomination started up in the US by a gay priest in 1968. The Church is not just for LGBT people it is for everyone but it is particularly open to those people who are discriminated against due for sexuality and gender. “I have always known God, I don’t know a time in which God was not part of my life, the major part of my life. I knew I would end up working in the church or doing some form of ministry although I ran away for many years, you can run away but God gets you in the end. I’ve trained for ordination and been a minister now for 12 years”. Shanon has been active in a number of LGBTI Christian and mainstreaming organizations including the Lesbian and Gay Christian Movement, the European Forum of LGBT Christian Groups and Sibyls, a Christian Trans Organization. They sometimes felt being discriminated against in LGBTI organizations because of their faith. “It’s quite sad, there is as much discrimination thrown at me by the LGBTI community because of my faith as I get from faith organizations because my sexuality and gender identity […] Many LGBTI people think that faith is against them, some think you must be mad to go to church and accept your sexuality […] but I want to get across to people that you don’t have to separate these things, it’s not either or…church maybe say all sorts of terrible things but that’s not God, that’s the church, these are human beings”. “I saw the pain of so many people who struggle to be either or….you cannot do that, that is a road to destruction and pain, you’ve got to find a way to reconcile the two [faith and sexuality/gender identity], that’s part of my work”. “We are very blessed in this country, the law has changed dramatically to make it easier for people to have the gender identity they wish, it is still difficult if you don’t fit in the gender binary. The sad thing is about the situation in the majority of Europe. There are still many atrocities happening and laws to enforce sterilization. The church has sort of accepted that they have to be careful about homosexuality, the laws are out there- they are less accommodating with trans people. If they do not pass in the chosen gender or are genderqueer, they are not accepted in churches, they are still major issues”. “It’s hard for trans people because when you have to struggle with your gender identity, they have so many fights in their life and they should not be doing that in church as well, church should be a safe space where people don’t have to fight”. “There is one important object that brings everything together, the Communion Host that represents the body of Christ… it’s important on a number of levels. The body of Christ is the queerest thing you can image because Christ is presented as male in this world..ehh.. but there is no way Christ could be male because the Christian understanding is that Mary was the only one human involved in the creation of Christ and only female genes, only the female karyotypes could have passed on to Jesus, there was no male sperm, no male karyotypes to be infused in the egg, so if they would tight the technology back when Christ was born and would have tested back then they would have found that he was genetically female even if he presented himself as a male to the world… to me Christ appears to be genderqueer”. “Being fully and truly who god created me to be is very much part of my faith journey as much as it is part of my gender journey, the two go hand in hand. I can’t know God better if I don’t know myself better. You know…Christ said we have to love God with all our strengths and love one another as ourselves. It’s only when we understand ourselves that we can love other people and love God. Those things have to go together they are not separate. Understanding my gender is part of understanding God and understanding God’s image is also understanding God’s gender…I cannot separate those two things, it is all intertwined, It’s not two journeys, it is one journey”.